What is TRAP sequence or acardiac twin? 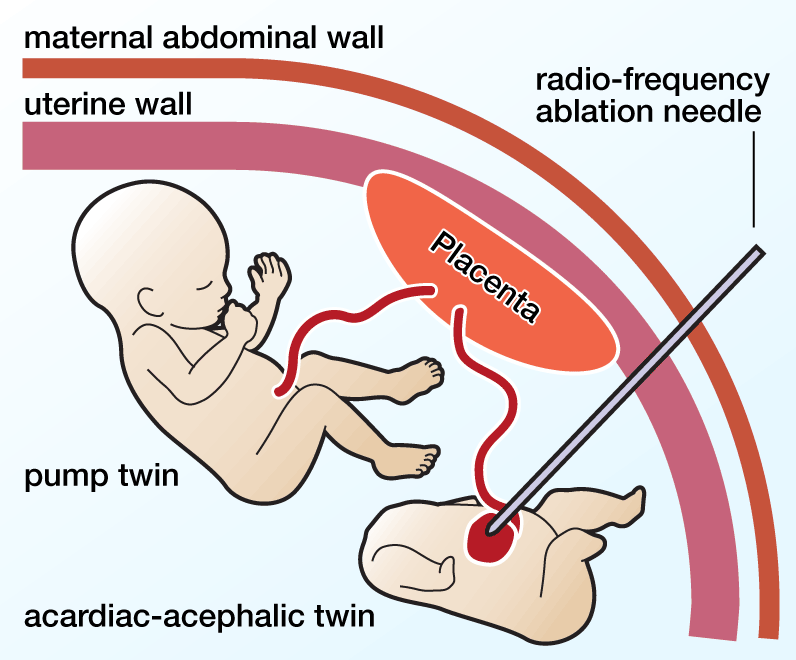 Twin reversed arterial perfusion (TRAP) sequence or acardiac twinning is a very rare problem, occurring in approximately 1% of monochorionic twins (MC, twins sharing one placenta). One twin is usually structurally completely normal. The other is an abnormal mass of tissue, consisting usually of legs and a lower body, but no upper body, head or heart. Because of the absent heart, the term “acardiac twin” has been used to describe this mass. The normal fetus is referred to as the “pump twin” because its heart is used to pump blood to the abnormal mass. The “acardiac twin” has no chance of survival. Due to the absence of a beating heart, the acardiac does not send blood to any portion of the placenta, and all of its blood supply comes from and goes back to the circulation of the pump twin through unique vascular connections on the surface of the shared placenta. Arteries usually carry blood away from the fetus and toward the placenta to receive oxygen from the mother’s circulation. When there is an “acardiac twin”, the unique vascular connections allow blood in the artery to flow in the reversed direction (toward the acardiac fetus rather than away from it). Thus, the phrase “twin reversed arterial perfusion” (TRAP) sequence has been used to describe this condition. The normal “pump” twin faces the excess burden of having to send and receive blood to the acardiac mass as well as to its own growing tissues. As such, the normal twin’s heart has to work extra hard and is under a lot of stress. This can result in heart failure for the normal twin. Left untreated, up to 50% of these otherwise normal twins may die in utero (stillbirth) or die shortly after birth. The risk of the normal or pump twin going into heart failure and dying seems to depend on the size of the acardiac. The larger the acardiac compared to the pump twin the greater the risk. The amount of blood flow into the acardiac also seems to play a role. The more blood flow the higher the risk. The harder the pump twin's heart is working, the greater the risk of heart failure also. All of these things can be followed with ultrasound and echocardiography. In cases of a large acardiac, these tests may have to be repeated frequently. Cases where the acardiac twin is small and there is little cardiac stress on the pump twin can be monitored by ultrasound. With frequent ultrasounds, we can follow the health of the normal twin and identify signs of heart failure. If heart failure of the pump twin is identified, and the pregnancy is in the third trimester then the normal pump twin would simply be delivered. In high risk cases where there is high blood flow to the acardiac twin it may begin to cause too much strain on pump twin's heart. Impending heart failure may be an indication for fetal intervention. Over the years many efforts have been made to treat TRAP sequence. The goal was to find a way to safely stop flow to the acardiac mass, so that the normal pump twin is protected and is no longer in danger of heart failure or death. Our center pioneered the most successful form of this treatment, taking advantage of advanced technology termed “radiofrequency ablation” (RFA) to stop blood flow into the acardiac mass. The RFA device is placed into the acardiac abdomen through the maternal abdomen and uterus. Energy is deployed through the tip of the device which clots the vessels supplying blood to the acardiac. The major benefit of the radiofrequency ablation technique, as compared to others such as laser or bipolar coagulation, is the size of the instrument used. The RFA technique uses a small 17-gauge needle, which is approximately 1 mm diameter in size (whereas as other procedures require 3 mm diameter instruments). Use of this smaller device leads to fewer complications, such as preterm labor, and less trauma to the pregnant patient. The procedure is performed using real-time ultrasound guidance. Having pioneered this technique, our center has the world’s largest experience with this approach. We have published our experience using RFA, and have shown over 90% success in treating monochorionic/diamniotic TRAP sequence pregnancies with an average gestational age at delivery of approximately 35 weeks. This compares favorably with other reported techniques that have been described for the treatment of TRAP, and has dramatically improved the outcome for pump twins in these pregnancies. San Francisco Parents of Multiples Club — a network of parents and expectant parents of multiples that provides its members and their families with friendship, support and information on parenting twins, triplets and quads. The Fetal Hope Foundation — provides support and information to parents, funds research, and increases awareness about TTTS, TRAP Sequence, Amniotic Band Syndrome, and Urinary Tract Obstruction. TTTS Foundation — solely dedicated to providing immediate and lifesaving educational, emotional and financial support to families, medical professionals, and other caregivers before, during, and after a diagnosis of twin to twin transfusion syndrome. Multiple Births — offers prenatal education and bereavement support information for parents with twins. Meyer family mother tells the story of her experience of the diagnosis of TRAP Sequence and the resulting pregnancy.